Vanessa Marcil is such actress who has suffered miscarriages for neither one nor two times but seven times. This is the reason why the personal life of the 49-year-old Beverly Hills star has always been a matter of curiosity. Vanessa is a twice-married & twice-divorced woman. She was first married to actor Corey Feldman but they eventually got a divorce. Then she went on to marry second husband Carmine Giovinazzo but their marital relationship also didn’t last for long. Vanessa has currently been engaged to long-term boyfriend MC. Let’s find more about Vanessa Marcil. To some extent, we will also discuss her affairs, relationships and dating history of the General Hospital actress. Stay tuned to us. As we mentioned earlier, Vanessa Marcil is a twice-married woman. 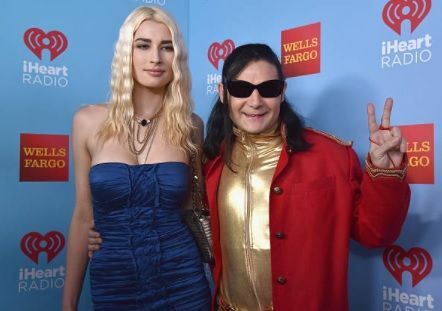 She first married a renowned actor Corey Feldman. The couple reportedly tied the knot in 1989 in a secret wedding ceremony and at the time they were very young. As per the report, Vanessa and Corey had their engagement before getting married. While they were engaged, the duo had been living in a two-bedroom Beverly Hills apartment together. The couple hid their marriage from their family for about a year. While they made their marital relationship official, the couple didn’t move in together, or adopt a married lifestyle. Unfortunately, after enjoying a romantic marital relationship for four years, they decided to split. Vanessa Marcil officially finalized their divorce in 1993. After 9 years of their divorce, Corey married to his second wife Susie Feldman, whom he later divorced in 2014. Corey shares a child, son named Zen Scott Feldman with Susie. The story doesn’t end here. The Stand by Me actor has currently been happily married to his third wife Courtney Anne Mitchell. After the divorce with Corey, Vanessa went on to date Beverly Hills, 90210 actor Brian Austin Green. When Vanessa Marcil joined the cast of a hit drama series, Brian Austin Green was her co-star in that series. That’s the time when the couple eventually started dating. They dated for a long time and while in the relationship, the former couple welcomed a son, Kassius Lijah together (born on March 30, 2002). They were not able to make their relationship last forever and thus they parted ways. The custody of the coupl’s child is in favor to the proud dad. After the divorce with Vanessa, Brian got married to actress Meghan Fox in 2010. The couple is since living happily together with Kassius. Recently, Brian and Megan went for a romantic getaway together on the island of Kailua-Kona in Hawaii where they had tied the knot. On 11 July 2011, Vanessa married to her second husband Carmine Giovinazzo, who is an actor best known for his appearance as Detective Danny Messer in CSI: NY. The couple held their private wedding ceremony at in New York City. In June 2011, the couple announced that they were expecting their first child together. However, Vanessa suffered a miscarriage second that year. At the time, she took to Twitter to share this bad news with her fans. Check it out. V has had a miscarriage. our second one this year. Vanessa filed for divorce in August 2012 citing the reason as ‘irreconcilable differences’. Their divorce was finalized in March 2013. The actress’ father Peter Ortiz passed away on September 14, 2017. After three years of her divorce from Carmine, in April 2015, Vanessa became engaged to a deputy sheriff, whom she refers to as “MC” on her official social media. Vanessa, who starred on the Hallmark Channel Original Movie Stranded in Paradise alongside James Denton, took to both Instagram and Twitter on 23 April 2015 to announce the adorable couple’s engagement. On the post she shared on Instagram, Vanessa was seen showing her stunning engagement ring. On 13 November 2017, Vanessa announced her pregnancy again and later on 9 January 2018, she revealed the baby she was expecting would be a daughter. But unfortunately, on January 27, the actress released a statement via Instagram revealing that she had miscarried for the seventh time. Our prayers are with you and your family Vanessa. Vanessa, who played Brenda Barrett off and on from 1992 until 2011, her fiancee MC and her kids from the previous relationship were involved in a serious accident on 26 February 2016. She and her kids were not harmed, MC was in serious condition as he was rushed to the hospital for the treatment at the time. Born on 15 October 1968 in Sally Vanessa Ortiz, Vanessa Marcil has a long list of boyfriends. Yes, she had been in relationships with many men in past. As per the report, Vanessa’s first boyfriend was American-Italian model Antonio Sabato Jr. They dated each other in 1989 and eventually broke up. Later, Vanessa went on to date her General Hospital co-star Tyler Christopher. The enjoyed a romantic relationship for two years from 1997 to 1999. Some sources even say that they were even engaged at the time. Vanessa Marcil had also dated ABC‘s Castle actor Nathan Fillion in 1996 and but their relationship didn’t last long and the pair decided to split in the following year. In the year 2005, Vanessa started an affair with screenwriter and director Ben Younger but in the same year, they parted ways without citing the reason for their split. Just after a year of her separation with Ben, in 2006, Vanessa dated Golden Globe Award and three consecutive Emmy Awards winner Jeremy Piven but ended the relationship in the following year. After suffering a lot of failures in relationships, Vanessa is currently living a happy beautiful life with her fiancee MC. With her talent and hard work towards her career, Vanessa has established herself a successful actress. She has been nominated for multiple acting awards, with winning a Soap Opera Digest Award for Best Leading Actress and a Daytime Emmy for Best Supporting Actress. According to Celebrity Net Worth, Vanessa Marcil has a whopping net worth of $4 million with a massive salary. Marcil has also had a number of non-acting endeavors. Additionally, in Los Angelas, Vanessa has also established Patricia House, an organization which helps take care of children whose mothers can’t afford to care for them, helping them find good homes. According to public records, in December 1997, Vanessa purchased the 4 bedrooms, 3 bathrooms double-storied building measures around 2,304 sq ft home in LA and its cost is $748K. Once Rumored Gay, Greg Gutfeld Married To Wife Elena Moussa: Do They Have Children? Or Any Divorce Rumors?